Expansion of Family Leave Laws to California Businesses Employing 20-49 Employees Has Arrived. On October 12, 2017, California Governor Jerry Brown signed the Parent Leave Act, SB 63, into law. Effective January 1, 2018, California employers with at least 20 employees will be required to provide their employees with 12 weeks of unpaid, job-protected baby-bonding leave of absence. Covered employers are private, state and municipal employers who directly employ 20 to 49 employees within 75 miles of each other. The employee has worked at least 1250 hours of service with the covered employer during the 12 month period prior to commending leave. The Parental Leave Act does not apply to employees who are covered by both the FMLA and CFRA, both of which already provide this same leave. However, CFRA regulations apply to the Parental Leave Act to the extent that they are within the scope of and not inconsistent with the Parental Leave Act. Provide 12 weeks of unpaid parental leave upon the request of eligible employees to bond with a new child within one year of the birth, adoption or foster care placement. Eligible employees can use any type of accrued paid time off, such as paid vacation and paid sick leave, during the 12 week leave. Maintain and pay for the eligible employee's continued coverage under a group health plan at the level and under the same conditions that coverage would have been provided had the employee continued to work. Guarantee employment in the same or comparable position upon the eligible employee's return from parental protected leave. In the event the employee fails to return from the leave of absence and the failure to return is not due to the continuation, recurrence or onset of a serious health condition or "other circumstances beyond the control of the employee," the employer are entitled to recover the portion of the premium paid during the leave. 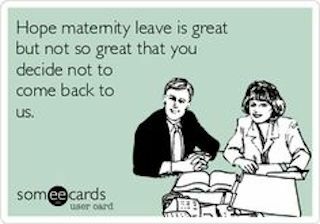 Where both parents entitled are eligible for leave are employed by the same employer, they are entitled to a combined total of 12 weeks of unpaid parental leave. The employer may, but is not required to, grant simultaneous leave to both employee parents. Finally, employers are prohibited from retaliating and/or discriminating against an individual for taking parental baby bonding leave, and from interfering with, restraining or denying an employees his or her right to take such leave. The Parental Leave Act provides for the creation of a two-year parental leave mediation pilot program. Under this program, within 60 days of receipt of a right-to-sue notice, the employer has the option to participate in the DFEH's Mediation Division Program. The employer's agreement to participate temporarily tolls the employee's statute of limitations and bars the employee from suing the employer until any of the following occur: (1) mediation is completed; (2) either party notifies the Mediation Division Program and all other parties that they are electing not to participate in the mediation; or (3) the Department notifies the parties that it believes further mediation would be fruitless. Seek a determination of whether your business is covered. Draft a compliant leave of absence policy, update your employee handbooks to include them, and include a carve-out from attendance and discipline for protected leave, just like any other protected leaves of absences. Develop leaves of absence forms and procedures. Train all persons in supervisory positions to identify when an employee may be eligible for leave and the requirements of the new law, especially with respect to the no-retaliation and no-discrimination provisions.